A 2-month-old boy presented with diminished shoulder movement. Radiographs revealed irregularity and sclerosis involving the proximal left humeral metaphysis (A). Differential considerations included healing proximal humerus fracture (including nonaccidental trauma [NAT]) and infection. An US image oriented in the sagittal plane showed the humeral head in appropriate position and a complex joint effusion (arrows, B). An axial MRI image showed a rim-enhancing joint effusion (arrow, C), abnormal signal within the humeral proximal metaphysis and epiphysis (oval, C), periosteal reaction, and soft-tissue edema (star, C). An enhancing lesion within the deltoid was concerning for abscess. Findings suggested multifocal osteomyelitis and septic arthritis. Neonatal osteomyelitis is a problematic diagnosis. Since fever may be absent, radiographic findings are often misinterpreted as a healing fracture and dislocation or Salter Harris I injury. Multifocal bone abnormalities are often questioned as NAT. Donnelly LF. Osteomyelitis. In: Diagnostic Imaging, Pediatrics. 1st ed. Salt Lake City, UT: Amirsys. 2005. 6:42-45. Coley BD, ed. Caffey’s Pediatric Diagnostic Imaging, Vol II, 12th ed. Philadelphia, PA: Elsevier Saunders. 2012:1477-1478. 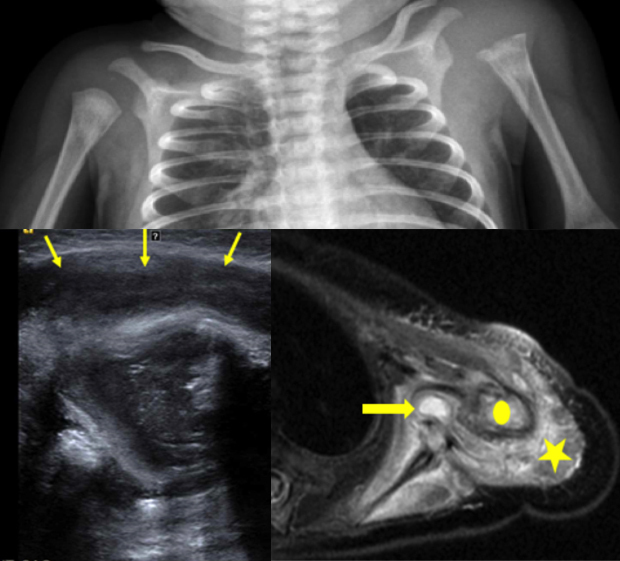 Smith S. At the Viewbox: Neonatal Osteomyelitis. J Am Osteopath Coll Radiol. 2017;6(1):35. Dr. Smith works with the Department of Radiology, Nationwide Children’s Hospital, Columbus, OH.